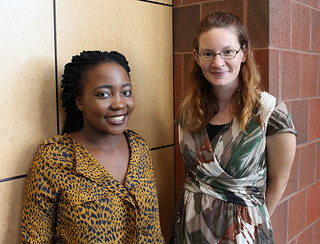 Batavia, NY- Genesee Community College is pleased to announce that Chantal I. Christina, a current student at the College, and assistant professor of English and ESL Kathleen (Kate) Klaiber were recently recognized by the New York College Learning Skills Association (NYCLSA) as award recipients. The announcement was made by the association in its fall 2015 NYCLSA newsletter. Chantal, an education student at GCC was named the 2015 Promising Student Award recipient, an award recognizing a student in good standing at an institution of higher education. Originally from Tanzania, Christina lost her mother at the young age of 10 and was then adopted by another family and relocated to the United States in 2007. She has been independent since age 18, and has successfully managed her own college tuition payments, cost of books, fees and living expenses. Chantal works very hard to maintain her successful academic standing as an independent young adult. The NYCLSA Promising Student Award with the $250 prize earning is very much appreciated. After completing her degree at GCC, Chantal plans to transfer to a four-year university to continue her education major and one day become a teacher. She currently resides in Syracuse when not attending classes at GCC. Kate Klaiber was recognized as the recipient of the 2015 Professional Development Award, an award that honors an individual that has been a NYCLSA member in good standing for two consecutive years or longer, and has worked in developmental education or learning assistance for two consecutive years or longer. With her $500 award from the NYCLSA recognition, Kate attended the Teachers of English to Speakers of Other Languages (TESOL) International Convention and English Language Expo in Toronto, Ontario last spring. Klaiber has been a faculty member at GCC since 2010 and was the 2014 recipient of the SUNY Chancellor’s Award for Excellence in Teaching. Kate resides in LeRoy with her husband and her daughter. For more information on the NYCLSA, visit https://www.nyclsa.org/. An online version of the 2015 NYCLSA News newsletter can be found at: https://www.nyclsa.org/uploads/3/1/1/4/31147931/nyclsa_news-_fall_2015.pdf. Chantal I. Christina (left) and Kathleen (Kate) Klaiber (right).